Files and documents are important information that should be stored safely in correct computer and correct partition, so that they can be at hand. Improper operation or unexpected errors happens to sensitive may lead to severe outcome or trouble. Computer operating system allows users to delete files that they no longer need, and deleted files can be restored from Recycle Bin provided by Windows system. But Recycle Bin is not panacea to restore deleted files, as it is unable to undelete files that don’t stay in Recycle Bin. File deleting is common action performed by users every day, for they want to delete private information to protect privacy, free up disk space or improve computer performance. It is really easy to delete files and folders off hard drive: we can simple drag them to Recycle Bin and then empty Recycle Bin; also we can select files and click “Delete” key (some people may click “Delete” and “Shift” at same time to permanently delete files). In fact, the operation “Cut” and “Paste” performs deletion, the file being cut is actually deleted during the process. Since deletion is so easy and frequent in our daily workings, we can’t make every “Deletion” correctly carried out, i.e. we may delete files we need by accident or by mistake. In that case, we need undelete tool to undelete data and files. Eassos undelete software is developed to help users recovering files that are deleted or erased unintentionally. It offers advanced recovery modules to undelete data from all storage devices, including Recycle Bin, PC, server, Raid, virtual disk, USB flash drive, SD card, CF card, etc. The downloading and installation of Eassos undelete tool is easy and for free. Scanning of deleted files can be performed to any partition on computer, and scanning process is automatically saved so that users do not have to rescan from start if program is closed. 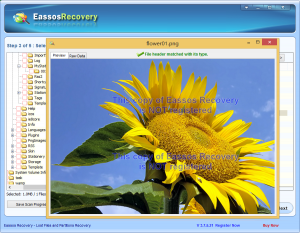 Let’s undelete files with Eassos Recovery. Step 1: install undelete tool to computer hard drive or USB drive which doesn’t need recovering deleted files. 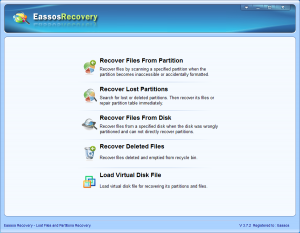 Step 2: Start Eassos Recovery and click “Recovery Deleted Files” button. Step 3: Select drive or partition that you want to undelete files and click “Next” button to scan files. Step 4: Preview listed files and save needed data. This entry was posted in Data Recovery and tagged undelete data, undelete files, undelete software, Undelete tool by EASSOS. Bookmark the permalink.